I was once again invited to a great press foodie event last Sunday by restaurant public relations specialist Susie Biehler, www.biehler.com, which took place at the famed MacArthur Park restaurant (www.macpark.com ) in Palo Alto. The event was a combined celebration of MaCarthur Park and its Executive Chef of one year and Owner Faz Poursohi (who also was the original chef there in 1981), and a recently launched cookbook for kids entitled "You've Got Recipes," by Jerry Ann DiVecchio, storyteller & Francoise Kirkman, art & design. 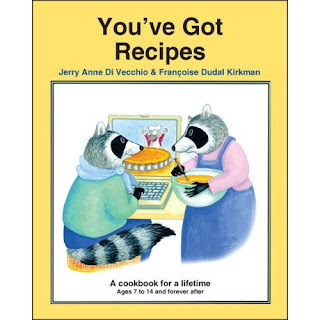 (Purchase book from authors: at events or from http://youvegotrecipes.blogspot.com). Jerry was food editor at Sunset magazine for over four decades, has written many cookbooks, and taught children's cooking classes. Francoise, who studied her art in Paris, was an art director and designer at the magazine for many years, and created many of the children's craft and art projects. OK, this wasn't your typical cooking class, but really a culinary adventure. The kids were treated to tasty fresh squeezed juices such as carrot, apple, and my favorite, strawberry orange, while they learned hands-on cooking techniques from the book's authors and Chef Faz and his team, such as tips on preparing artichokes for cooking, how to add a spicy rub onto ribs, and the exciting finale - blueberry oatmeal crumble which - yay! they could take home in a personalized dish. Next, parents and kids alike were treated to a delicious buffet brunch where the artichokes came out elegantly baked, his award-winning ribs were juicy and tendy, and accompaning dishes of Faz's signature chips (definitely addictive) and a tasty mac and cheese made for a scrumptious picnic. And for dessert? The blueberry oatmeal crumble, of course! Chef Faz ( http://www.fazrestaurants.com/) has a true passion for cooking, and specializes in grilled Mediterranean and Middle Eastern dishes. His other restaurants include Faz Sunnyvale, Danville, and Pleasanton. He has been featured on "Eye on the Bay" and has received rave reviews throughout the Bay Area.